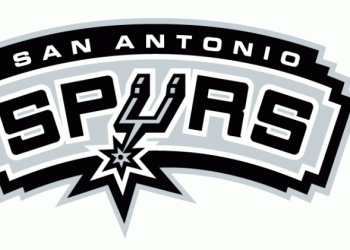 The San Antonio Spurs are an American professional basketball team based in San Antonio, Texas. The Spurs compete in the National Basketball Association (NBA) as a member of the league's Western Conference Southwest Division. The team plays its home games at the AT&T Center in San Antonio. The Spurs are one of four former American Basketball Association (ABA) teams to remain intact in the NBA after the 1976 ABA–NBA merger and are the only former ABA team to have won an NBA championship. The first three games of the Western Conference first-round playoff series between second-seeded Denver and seventh-seeded San Antonio have boiled down to which team received better play from its backcourt. The Spurs grabbed a 2-1 lead in the best-of-seven series with a 118-108 home win on Thursday as two pieces of its three-guard attack -- second-year pro Derrick White and veteran DeMar DeRozan -- combined for 61 points. The Nuggets now have lost 14 straight games in San Antonio, a streak that began on March 4, 2012, when White was a 17-year-old senior at Legend High School in Parker, Colo., about 25 miles southeast of Denver.